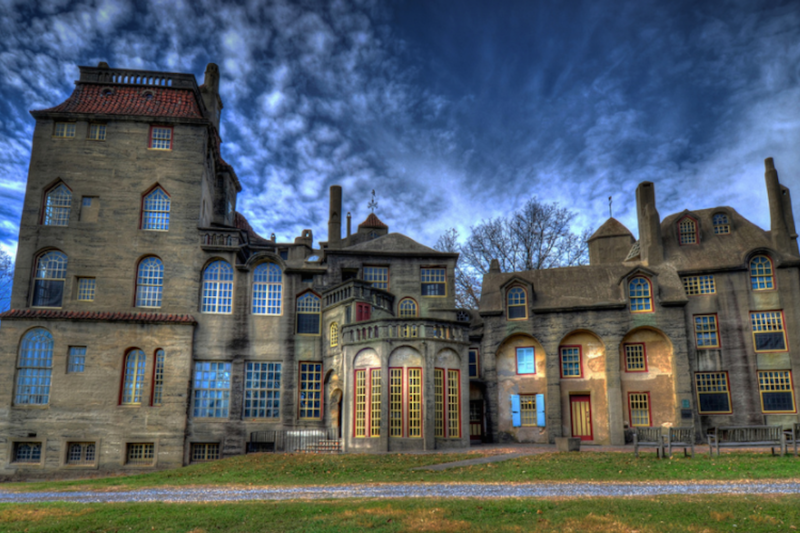 Rent Fonthill Castle Estate & Mercer Museum | Corporate Events | Wedding Locations, Event Spaces and Party Venues. Fonthill Castle is approached down a long buttonwood tree-lined drive and is surrounded by 30 acres of rolling lawns, peaceful woodlands and pretty meandering streams. The beautiful Elkins Gallery, a stately Georgian room displaying the museum’s collection of Bucks County paintings, can be booked for intimate gatherings or large groups up to 150 people. A vintage baby grand piano and two fireplaces with mantels flank the intimate space. Seasonally, the adjoining Garden Patio Tent is included in your rental by Memorable Affairs Catering, offering a beautiful outdoor garden space for a reception or cocktail party. The beautiful outdoor garden tent can also seat up to 120 guests for dinner. Capacity in the air-conditioned Elkins Gallery, with dancing, is 80 for a unique seated wedding dinner. The combined capacity in the gallery and tent is 150 for dinner with dancing. The Museum’s grounds offer ample space for an al fresco wedding ceremony and unique photo opportunities amongst the vintage artifacts. Elkins Gallery special event rentals include time for your guests to visit the unusual Mercer Museum Castle in an intimate and personal way. Fonthill Castle is the perfect setting for Grand seasonal outdoor tented wedding receptions! With capacity to 200 guests with tenting (included) or intimate indoor wedding reception capacity under 40 guests year round. Fonthill Castle is approached down a long buttonwood tree-lined drive and is surrounded by 30 acres of rolling lawns, peaceful woodlands and pretty meandering streams. Events at Fonthill are a feast for the eyes and senses: enjoy cocktails on the balcony of the Terrace Pavilion before descending the curving staircase to dine and dance under chandeliers in the intimate White Wedding Tent nestled beside the castle.